Flowers have always been a part of our gardening and farming ethos, so they’re seen as important as weekly salad greens and herbs. A CSA is a symbiotic relationship between farmer and consumer. Customers purchase shares, thereby becoming “members” or “shareholders” in a farm. In return, the CSA member receives a weekly assortment of agricultural goods, reflecting the current bounty of the season. CSAs allow small family farms to continue to produce and grow high quality fruits, vegetables and flowers while providing consumers with a real and direct link to their regional food shed. What makes a Pastures of Plenty farm CSA share special? Cooking Classes: Members are treated to three seasonal cooking classes in the Farmhouse kitchen. These classes are taught by Sylvia, Lyle and Slow Food Culinary expert and teacher Gigia Kolouch (first come, first serve; 12-person limit). Farm Parties: Our members are invited to two farm parties every season—the “Midsummer’s Eve” party and the “Harvest’s End Party” to close out the season. Weekly Newsletter: Members receive our weekly newsletter, ‘Plenty’, full of recipes, ingredient tips and musings from the farm life of Syl and Lyle. Business Memberships: Receive share deliveries to their place of business or community gathering places where five or more people sign up. Pastures of Plenty farm asks that our members maintain a sober understanding of the seasonality of a farm, and the environmental and human factors that affect a farm’s output—especially an organic farm. We strive to always provide our members with the most seasonal and high-quality vegetables and flowers. In truth, there will be ‘gap’ weeks due to the forces of nature, from drought conditions to flooding. So, if you are looking for a set quantity or number of pounds of food each week, we simply can’t promise that. We do promise to pack shareholders bags each week with a true reflection of that week’s harvest. A mix of seasonal vegetables and two bouquets of flowers, as well as a ‘Treat of the Week‘ from our regional food shed farmer friends. This weekly surprise share of produce honors and supports those farmers, ranchers, and artisan producers who enrich our community. A generous portion of seasonal vegetables, fresh herbs and two large mixed flower bouquets, plus a ‘Treat of the Week’ from our regional food shed farmer friends. 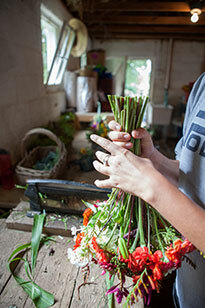 Each week you receive two bouquets of organically grown flowers. 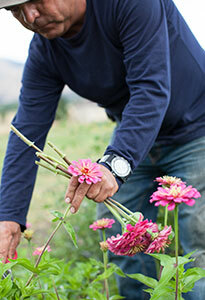 One large bouquet per week, plus one bunch of single variety flowers such as lilies, sunflowers, dahlias, or larkspur. Simply download our CSA Form. For more information please contact Pastures Of Plenty farm. Enjoy the bounty of a regular, large or flower, 16-week CSA share. Sign up today and support local agriculture in your community! Visit us on Market Day!